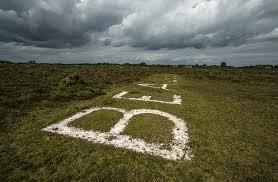 The Beaulieu Letters are eight enormous concrete capital letters cut into the turf which spell out the word BEAULIEU. They were used to help early planes identify the aerodrome from the air. 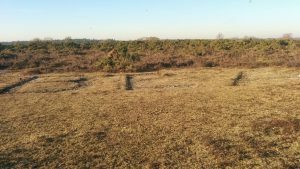 They’re located close to the main Beaulieu to Lymington road near Hatchet Pond, on the edge of the old WW1 aerodrome opposite the entrance to Hatchet Moor car park. The whole feature measures approximately 5 metres by 34 metres. It i s believed the letters date back over one hundred years to the early days of flying and the Flying School at East Boldre which was established in 1910. Pilots’ logs of the time often mention how difficult these early landing grounds were to find and of course there was no radio communication. So the letters would have been a very logical, practical and extremely useful solution. 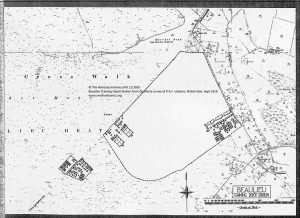 Click here if you’d like to read more about the history of the Beaulieu Letters and the airfield at East Boldre. Following the closure of the Beaulieu airfield after the First World War, the letters were gradually allowed to become overgrown, until in 2010 during the celebrations for the Centenary of Flying from East Boldre, a local enthusiast conceived the project to restore them. 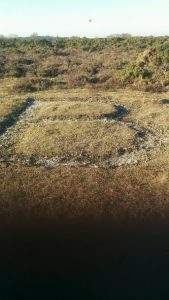 That weekend the Forestry Commission organised a series of guided walks across the old airfield and the letters, which were only just visible as outlines in the turf, formed the turning point and the highlight of the walk. After a period of monitoring to check the removal of the turf would cause no disturbance to any sensitive species, the work was completed in March 2012 in 3 days by a team of volunteers whom we have to thank for the revelation of the sharp outline of the letters looking just as it had been over 100 years ago. To see them from the ground you do have to get up close. Setting off from the Turfcutters Arms in search of the letters you need to go out the back entrance across the forest or a short distance along the road, essentially making your way to the back of the village hall. From there it’s approximately 10-15 minutes walk heading diagonally across the heath towards the Lymington road. When you get up close you’ll find the letters are really pretty big! And you may well experience a sense of the history of those early flying days of long ago. Depending on time of year and weather conditions, the walk can be either a pleasant relaxing stroll, or some serious exercise after which you’ll thoroughly deserve your pub lunch or supper. In the best weather you might be enjoying the last rays of the sun towards the amazing sunsets we see across the heath from East Boldre or you might be bracing yourself against our prevailing winds blasting in across that same heath! Whichever of these extremes you experience or somewhere in between, we hope you enjoy retracing some historic steps and discovering the Beaulieu Letters, and look forward to welcoming you at the Turfcutters before, after or both!